Continuation from the previous 104 parts, the whole series can be found at http://www.nikoport.com/columnstore/. 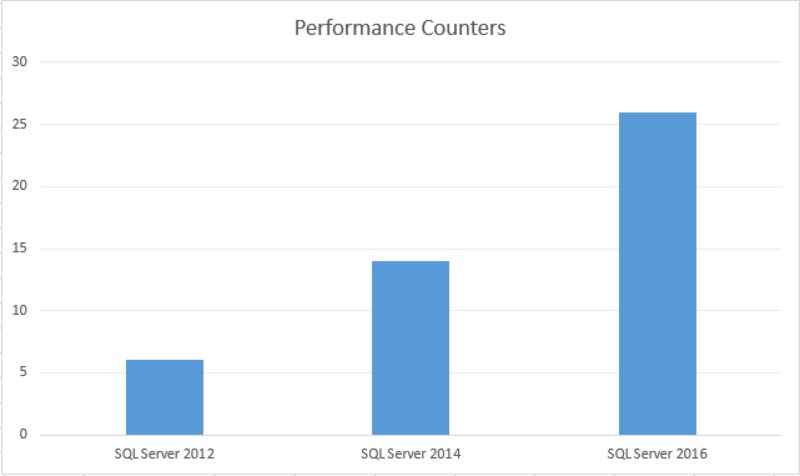 For a very long time I was intending to write some of the unsung & almost hidden improvements of the SQL Server 2016 – the performance counters. To my knowledge, the only person mentioning them, even though very briefly, during presentations was Sunil Agarwal (Tiger Team, at that time he was the Program Manager for the Columnstore Indexes at Microsoft). Great Lonny Niederstadt has defended for quite some time the usage of the performance counters in comparison to the DMV’s to soften the observation impact whenever possible and after Tuga IT 2017, I thought – I need to finish this blog post desperately, because way too few people are using/mentioning performance counters, while SQL Server 2017 is almost released – keep on writing about SQL Server is not exactly what I intend to do. Since the initial release of the box version with the Columnstore Indexes (SQL Server 2012), there was always a need for getting some insights over the statistics of the Columnstore operations. Unfortunately the initial release was quite rushed and if you wanted to use Performance Counters with SQL Server 2012, you would be limited with just 6 counters that were focusing on the Columnstore Object Pool from the point of view of the Memory Broker clerk. Below you will find the full list of those 6 counters with a short description of what they do. For monitoring Columnstore Object Pool size behaviour this is an incredibly valuable information, especially if you observe that your workloads starts to slow down because of the read disk access for the Columnstore Indexes, even though there is enough memory around. Simulation benefit – The value of memory to the clerk, in ms per page per ms, multiplied by 10 billion and truncated to an integer. Simulation size – The current size of the clerk simulation, in pages. Internal benefit – The internal value of memory for entry count pressure, in ms per page per ms, multiplied by 10 billion and truncated to an integer. Periodic evictions (pages) – The number of pages evicted from the broker clerk by last periodic eviction. Pressure evictions (pages/sec) – The number of pages per second evicted from the broker clerk by memory pressure. 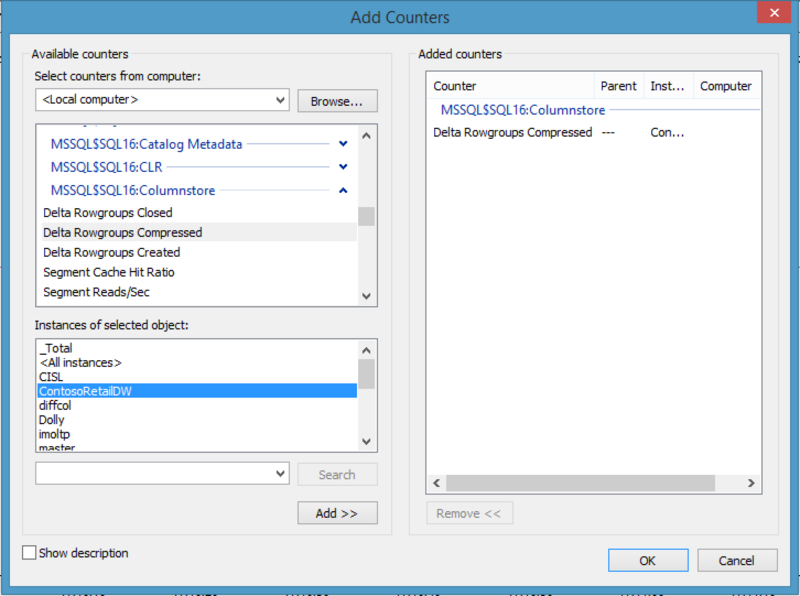 In SQL Server 2014 the number of performance counters, related to the Columnstore Indexes was improved from 6 to 14 with addition of 8 new counters that provided some basic information on the Row Groups locking. A new instance “RowGroup” was added to the MSSQL:Locks object providing information on the locking part of the Row Groups, and if you want to see how bad locking of the Row Groups was in SQL Server 2014, please consult the following article Clustered Columnstore Indexes – part 8 (“Locking”). Short resume: unless you are using Data Warehousing/Reporting in SQL Server 2014 with the Clustered Columnstore Indexes – avoid them at almost all cost. As mentioned right in the beginning of this article, Sunil Agarwal lead the development team into adding greatly valuable performance counters with it’s own object ‘MSSQL:Columnstore‘ that provides some incredible insight on some of the internal operations that are not exposed in other ways. This was a very much needed step, because SQL Server 2014 has brought a lot of different performance counters and objects for the In-Memory (XTP), while Columnstore Indexes were deserving a good treatment of their own. Delta Rowgroups Closed – Shows the number of the Delta-Stores that were closed by the engine and waiting for the Tuple Mover or manual operation to compress them. Delta Rowgroups Compressed – This one shows the number of the Delta-Stores that were compressed into the Row Group. Notice that the Bulk Load API with amounts equal or superior 102.400 will not be accounted here, since no Delta-Stores are created in this scenario and the data is directly compressed into the Row Groups. Delta Rowgroups Created – Shows the number of the Delta-Stores created. Segment Cache Hit Ratio – Ratio for finding the Segment within Columnstore Object Pool. Segment Cache Hit Ratio Base – The ratio is the total number of cache hits divided by the total number of cache lookups over the last few thousand page accesses. Segment Reads/Sec – The number of Segments read per second. This might be a good indicator of the SQL Server Instance performance, even though the segments in their sizes can vary greatly. I consider that joining this information together with the amount of compressed data processed and the aggregate predicate pushdown as the base for the performance evaluation. Total Delete Buffers Migrated – For OLTP scenarios, this information will provide the number of Deleted Buffers that were migrated into the Deleted Bitmap. Total Rowgroups Compressed – The total number of the Row Groups that were compressed. Incredibly valuable if you are constantly loading data and forcing incomplete Row Groups closure. Total Rowgroups Fit For Merge – This counter will be increased when the counter Total Merge Policy Evaluations returns a positive result of the evaluation. Total Rowgroups Merge Compressed – the number of compressed Row Groups during Merge operations. Total Source Rowgroups Merged – the number of self-merged Row Groups. Delta Rowgroups Compressed counter. It will allow us to monitor the behaviour of our system and potential impact, because resource allocation for this operation are far from being trivial and there will be a blog post on this topic soon. 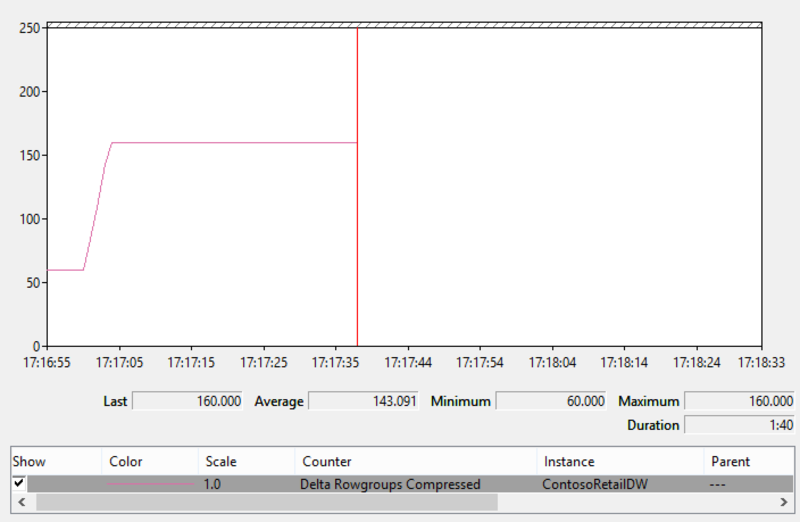 I love it when complex tasks become easy and performance counters are very important tools in the arsenal of someone trying to understand the behaviour of the monitored system, and I am glad that so far every single version of SQL Server increased the overall number of Performance Counters. I have checked on the new performance counters at the CTP 2.0 and there were none, but I have no doubt that overall there will be new items, especially with the port to Linux. From my side, I would love to have some indications of the advanced functionalities being exposed as the counters, for example Aggregate Predicate Pushdowns or Columnstore Indexes scans being executed with Row Execution Mode. The Adaptive Query Processor deserves a couple of counters for sure. I am not holding my breath and I do not consider those ones to be vital at the moment, but still would be nice to see some evolution within the product with a new version. Please elaborate more about these 3 . Will be very helpful. As for the 3 items mentioned, they are useful internally for determining the amount of memory that will be allocated for the respective Cache Store. This is how SQL Server decides what and how much to keep in the memory. Never mind :-) I found dm_db_column_store_row_group_operational_stats actually does track this (the counters weren’t increasing how I expected). I suppose if there was a “delta store access” perfmon counter it probably wouldn’t be too useful by itself as you’d need to have an idea of the number of rows it contains to verify whether it’s an issue. glad to hear that you found the solution fast.